With the seasons, the new semester, and the changing of the clocks, my thoughts have shifted away from the ghost of Hamlet and Gatsby to the ghosts of media where corporate barons and would-be princes have greater global influence. I’ve decided to post a series of meditations on media. In these mediations, I’ll negotiate my way through contemporary communications. Teaching Grade 11 Media Studies presents many challenges. Most significant is this; the course is offered at an open level, yet the 8 key concepts are abstract and the implications of these concepts requires some higher order critical thinking. Not many students are emotionally or cognitively developed to meet the expectations. I often find myself revisiting my thinking about the key concepts. One of the concepts that came crashing down upon me while struggling to write a communication skills textbook for McGraw-Hill is this. Many teachers talk about technology changing the way contemporary culture communicates. 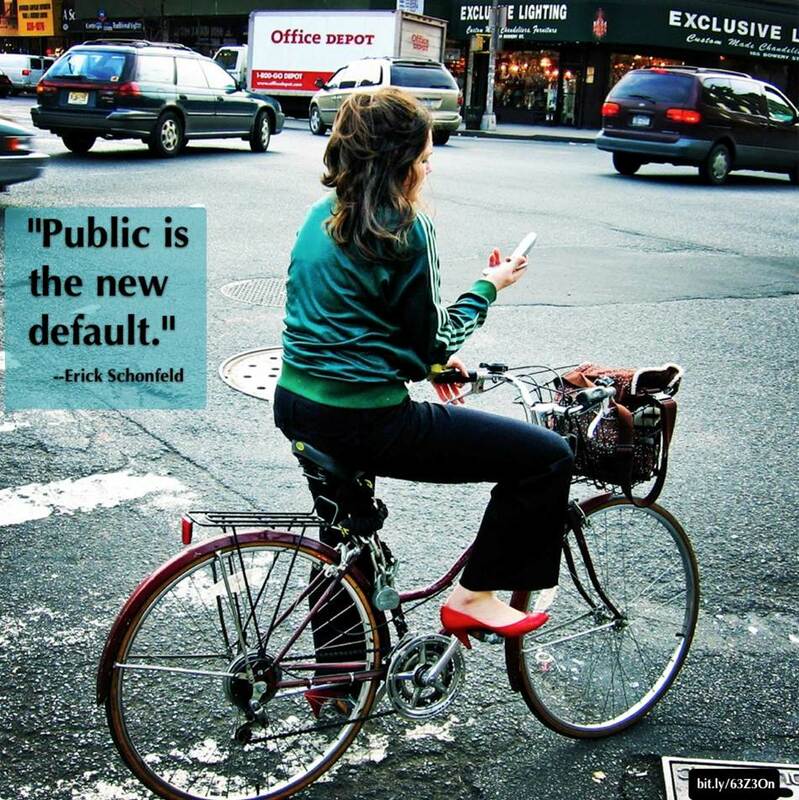 And, even though communication modes are changing, it is not always technology that is prompting this change. 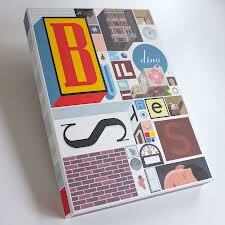 Take Chris Ware’s new graphic novel, Building Stories. The form of this graphic novel is print (concrete and static), but the author changes the conventions of the form merging them with those of comic books, game boards, jigsaw puzzles, memory boxes, and possibly more. I read an interesting article, “The Conscious Materiality of Chris Ware’s Building Stories” by Shawn Huston which can be found here: http://www.popmatters.com/pm/column/166841-the-conscious-materiality-of-chris-wares-building-stories/ and watched this unboxing of the book video. 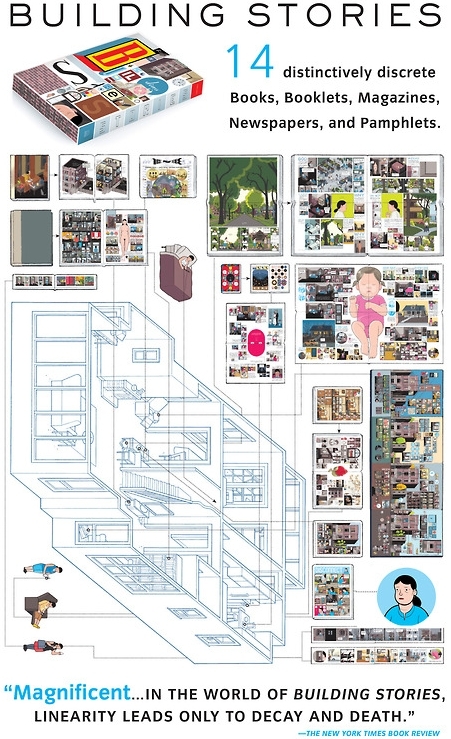 Changing technology plays no role in Chris Ware’s innovative form of communication. Instead of changing technology being the singular factor changing communication, I see a converging of the conventions within forms. Despite change, the key concept still holds true – form and content are still closely related, because Ware was restricted to the print medium. He took the conventions of multiple print forms to communicate his narrative. Another example that demonstrates this key concept can be found in Rives TED talk, “A story of mixed emoticons”. Rives’ narrative is limited to the shape of punctuation and the number of visual symbols that can be made with those marks. This narrative form and its contents are closely related; in deed, the contents and the story itself are entirely restricted by the form and the use of emoticons. I think that students, now more than ever, need to understand how to read the conventions of form and then to recognize how content is shaped. This is not unlike the traditional methods of identifying similes or metaphors so students can appreciate the reading, and effectively communicate using them. However, the converging of forms has complicated the reading and writing process both for the student and for the teacher. I think that teaching the traditional skills of reading and writing still applies, but recognizing how conventions break out of the controls of genre will help students acquire the skills needed in the revolution of contemporary communication. The key concepts of media studies help with this. The boundaries of genre once controlled by conventions are being smashed as advertising enters journalism and live voices are replaced by texts or tweets. I believe these changes have made the key concepts more relevant and more important to understanding communication in the revolution of convergence. 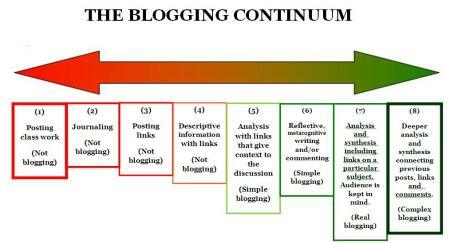 Students in my grade 12 University English class discuss the experience of blogging throughout the course. Hamlet is a play about what it is to live and to die. Hamlet, the character, explores notions of the moral life while recognizing the complications of mortality. I think Shakespeare must have been worried about death. Hamlet certainly worries about “the undiscovered country” and speculates that we are often hesitant or cowardly in our behaviour because we believe that our actions may be sins which follow us into the afterlife. But how can I write that in a theme statement? Themes are never topics or phrases. Themes are the author’s message about life. So if you have to write a statement about what it means to live, or to die, what better play than Hamlet? One way to uncover themes is to begin by thinking about the problem in the text and its opposite. There are many ways to express the themes of Hamlet. Amy’s comments during our discussion today prompted me to write about the role of isolation in developing some of Shakespeare’s themes in the play, Hamlet. Hamlet’s suffering over the memory of his father and thinking how to act on his revenge turns him inward and away from the moment. Here, Hamlet intellectually isolates himself. This intellectual isolation is enhanced by the fact that he does not return to Wittenberg to continue his studies. Memories, or reflections on the past take Hamlet out of the experience of existence, or out of his being. In this way, he emotionally withdraws from the world around him in favour of emotions once experienced. Hamlet sends Ophelia away “to a nunnery” isolating himself from romantic love, and this accelerates into a distrust for all women isolating himself from his mother, Gertrude. Through deception and feigned madness he isolates himself from friends and family, and arguably he alienates himself from reality. Physical isolation begins after Hamlet believes he is “too much i’ the sun” and “dreadfully attended” until he says “Now, I am alone”. Finally, Hamlet’s self-imposed isolation could be seen as a form of self-destruction. Caution: the following animation from “Waking Life” has mature themes and images that may be disturbing. I was listening to this radio program on the weekend about lying. There is an interesting documentary made by CBC called “The Truth about Liars” and it reveals some nasty truths about our deceptive ways. Fortinbras deceives his Uncle, and Claudius. Although many writers call these ideas “appearance vs reality”, I believe it is a bit more complex in this play. In fact, the opening question of the play suggests that no one can be certain of anything. Uncertainty is a fact of life, and one of those inevitable instabilities that we must accept. We can never be certain. This week I’d like to encourage discussion about the themes in Hamlet, and each post will address a different theme or approach to themes in the play. 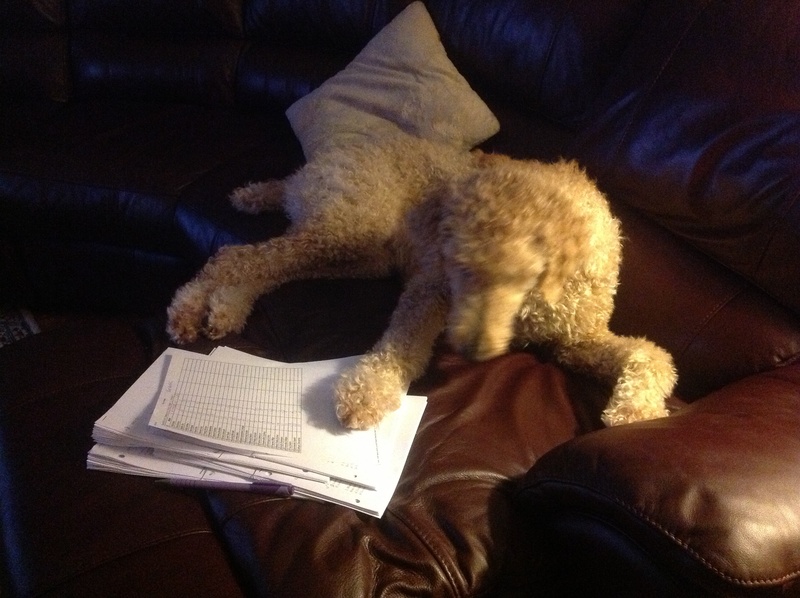 This morning, while trying to coax my dog into doing my marking, I was mulling over the topic of revenge in the play and Shakespeare’s message about the nature of revenge. The play is clearly not your typical revenge tragedy – it is a messy business. Three sons seek revenge for a father’s murder, but each son responds differently. 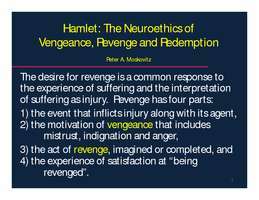 Shakespeare raises questions about the purpose of revenge and the legitimacy of seeking revenge. While each character feels the urge for vengeance, the word and the action often differ. Hamlet raises this question of revenge through the motif of acting and the players. He is amazed that the Player King can respond with such genuine emotion to Hecuba. And he, himself, lives with knowledge that should vault him into immediate action. 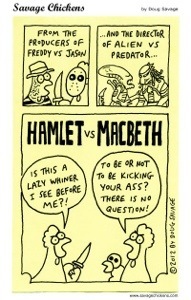 Hamlet’s inner conflict demonstrates the complicated nature of seeking revenge. Act 1 Scene 5: Hamlet promises his father to revenge his murder, but struggles with the ethics and responsibility of this role. Act 2 Scene 2: Hamlet criticizes himself for not action and compares himself to other legendary figures who have sought revenge. Act 3 Scene 3: Hamlet has the opportunity to kill Claudius while he believes what he sees is his confession; however, Claudius cannot confess and Hamlet misses his opportunity while thinking about sending him to heaven. Act 3 Scene 4: Hamlet Senior reminds him of his responsibility to see revenge while Hamlet is with his mother. Act 4 Scene 5: Laertes responds to revenge with passion and action; he decides to seek revenge without hesitation. Act 5 Scene 2: Claudius’s scheme to kill Hamlet results in the death of most of the major characters. However, in the last desperate moments before he dies Hamlet gets his revenge and kills Claudius. 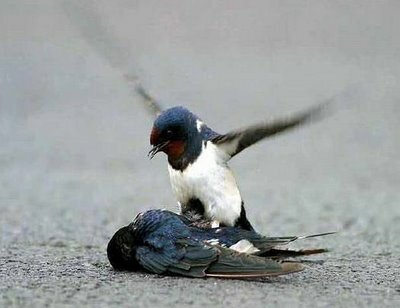 But Hamlet dies in seeking revenge, so what is Shakespeare saying? Don’t just sit there and think – act! Make a comment and start the discussion. I was listening to the radio on the weekend, and there was this interesting piece on Spark. I can’t recall if it was the CBC program or some news story, but my interest was sparked when I heard this story about “recursive thinking” and schools in the US that are teaching students how to think using recursion while reducing the emphasis on knowledge of content. If you’re not sure what recursion is, you might remember this clip of Patrick from Spongebob Squarepants. The ability to think about thinking may be the critical attribute that distinguishes us from all other species. A dog chasing his tail has nothing on the human race. Recursion—a process that calls itself, or calls a similar process—may be a fundamental aspect of what it means to be human. In the human mind, recursion is actually much more complex than the notion of returning to the same place over and over. We put phrases within phrases because we hold thoughts in memory; thus we have language and a sense of a past self. We are aware that we are thinking about what someone else is thinking; on this awareness we build a sense of self and the ability to be deceptive or to act on shared belief. Recursion gives us the ability to mentally travel in time. It is fundamental to the evolution of technology: Human beings are the only animals that have been observed to use a tool to make a tool. Looking at human language and thought, psychologist Corballis finds recursion within recursion. Hamlet employs a form of recursion in his thinking and rethinking. 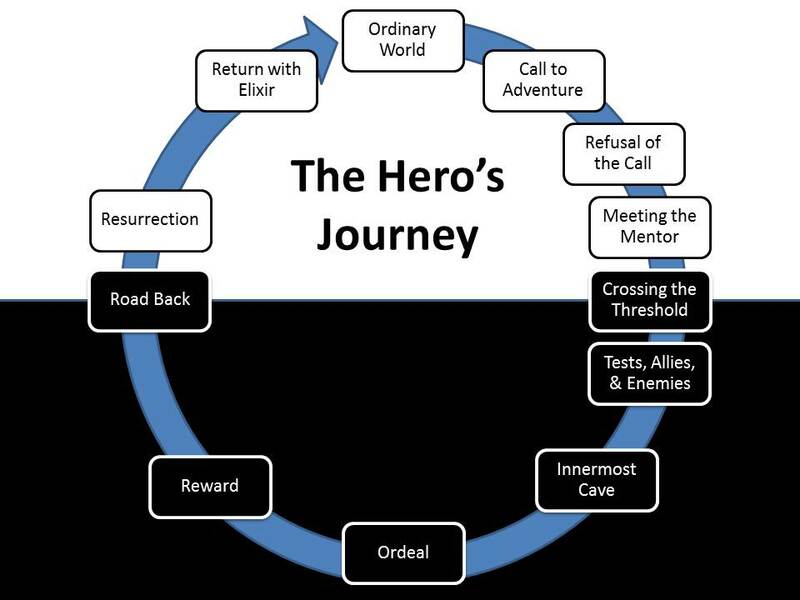 In fact, if we consider the character, Hamlet, to be a hero, then we can look at his whole journey like Joseph Campbell’s monomyth, the Hero’s Journey, which is recursive. Thinking about our reading and writing, then revisiting the same thinking helps us refine and redefine our perspectives and the articulation of those perspectives. In fact, I just realized that I am right back where I began this blog, rethinking about rewriting. Back to the beginning at the end. 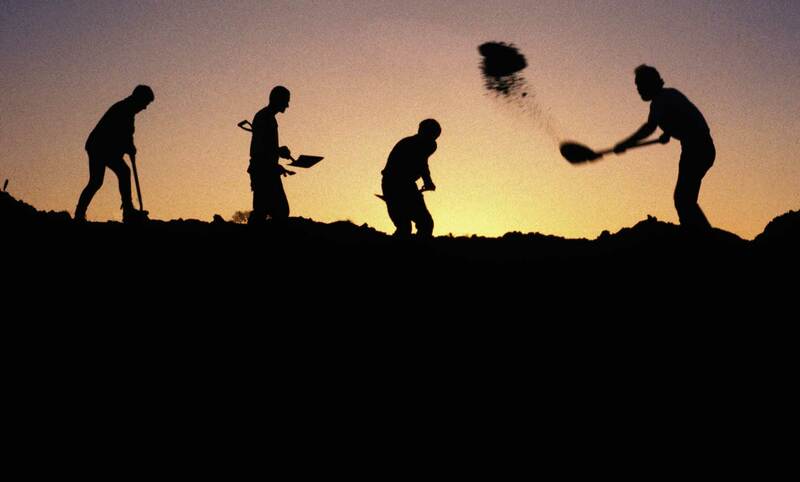 I love the grave digger’s scene in Hamlet. Irony abounds as the audience explores life in death. But the play never really dies. Shakespeare finds immortality in Hamlet. Digging through Shakespeare is not unlike archaeology whereby the reader excavates the words and attempts to piece together evidence to build some sense of meaning. Of course, Hamlet uses a foil in the final fight scene of the play, and even says to one of his literary foils, Laertes, “I’ll be your foil.” Ms. Meldrum inspired me the other day into thinking about the foils in Hamlet, and because there are several, I decided to frame them around abstract ideas which can then lead us to thinking about the major themes of the play. Literary foils are secondary characters which offer an audience contrasts that highlight important aspects of the main character. 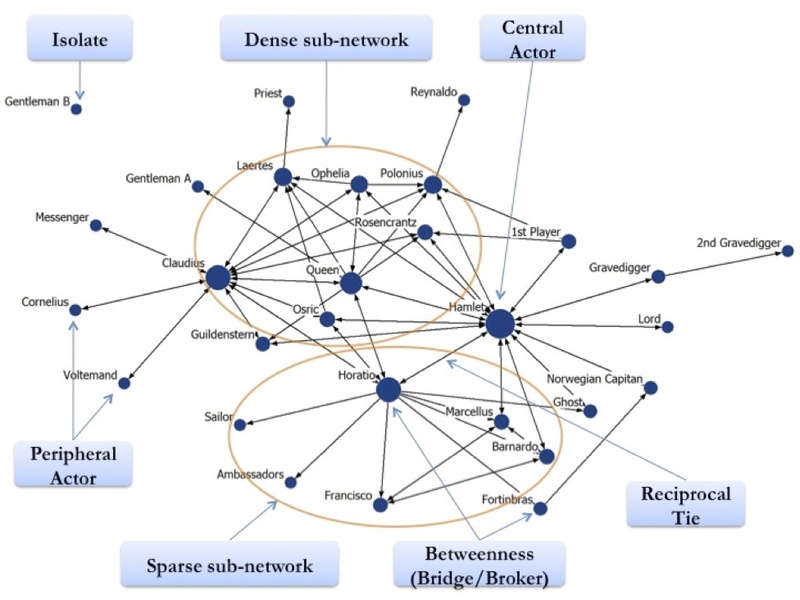 There are some similarities, but enough differences, and it is through these differences that the audience learns about the protagonist. All three are young men whose fathers have been taken from them by another. All three feel an injustice has been done to them and that they must seek revenge for their fathers. However, each act differently on that desire for revenge. 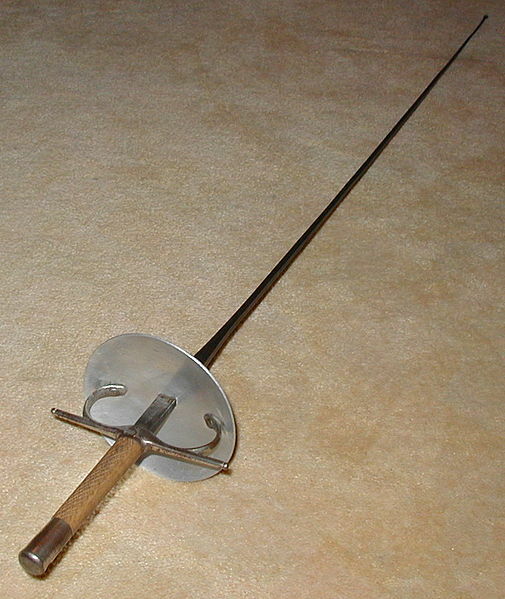 Laertes acts passionately, quickly, and without forethought. 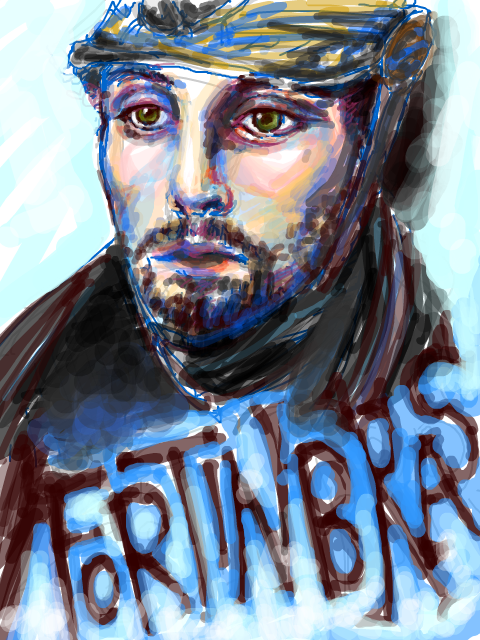 Fortinbras acts, then retreats, and plans carefully for his revenge. Hamlet feels passionately, attempts to act, then retreats, and dies as a tragic victim of his own indecisiveness and inaction. Hamlet values honour and loyalty, and only decides to descend into madness when he feels that he cannot trust many in the Danish court to act honourably. The old friends Rosencrantz and Guildenstern collude with Claudius, while the old friend, Horatio remains steadfast and true to Hamlet. 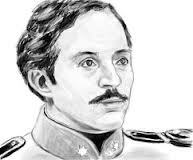 R&G become a pair of pawns manipulated by a dishonourable traitor to the state. While Hamlet’s “madness” is debatable, Ophelia’s is pure. Horatio is the stoic man of great intellect and reason. He is the only man left at the end of the play to tell the story of Hamlet, to facilitate the transition of power from Claudius to Fortinbras. Academics continue to analyse and debate the meaning of “the rest is silence” and the ambiguity of the words is certainly fitting with the ambiguous wordplay of the protagonist, Hamlet. He also points out the meaning associated with Fortinbras and Hamlet in which “the remainder of his life can have nothing to say…no ‘warlike noise'”. And if “rest” is death, then life is unrest and “the afterlife has nothing to say about matters of this world”. The two are separate states. In the end, the character and the play validates “the world of the mind over the world of matter”. However, this parting line has not created silence in this living world of unrest fraught with creative expression and many artistic renditions, spoofs, interpretations of this line have materialized. This foreign film of the same name shares some common themes. Hamlet is never silenced in the immortal words of Shakespeare and I only hope you revisit this play again, and again, and again, each time realizing that the words and meaning can never be put to rest.